That really sounds like more than it actually will be. I promise. Especially since I'm remembering my week in pictures and clearly this week I was not only a slacker in the blogging department, but also the picture taking department. There was a lot of water play this week. What with the weather finally deciding to be both hot and sunny...all week. This is me jumping for joy on my couch. You know except that I'm not, since I'm blogging. The things I sacrafice for you, all five of my readers. First we played in the water at a local park. Preston was pretty excited because it was his first time in the splash pads this year. Last year he loved them, so I had no doubt that he would love them again this year. He did not prove me wrong. As soon as he saw the water he was itching to get away from me and play in it. The horrible mother that I am forced him to wait until I'd changed him into his swim trunks and then away he went. The water play was only paused long enough for a snack with his buddy Zack and then he was off again. My boy is going to love summer! Since I was so excited about the good weather I invited some friends over to play with all of our backyard pools. We had such a good time. Preston really seemed to enjoy having friends over and I know I sure did. Now if only Preston could get past this terrible two thing that seems to be taking over from time to time. If you notice Preston's puffy red face in the photo with the four wheeler it is because his mean Mommy informed him that it was now Aidan's turn to ride. How horrible of me right? Moments later Preston attempted to steal the four wheeler back by pulling Aidan off by his arm! Ummm, hello mortified I'm sure we're going to be great friends over the next year or so. Preston did try to redeem himself by helping Zeke push around a red car like a nice little friend. You know until it was Zeke's turn to take a ride in the car. Even with Preston's naughty behavior I had a good time and I hope my friends did too! We celebrated a certain someone, ahem, my sister's birthday. Happy Birthday Jessie! Where I also made her pose for her first belly shot. Hello, little baby! Big news, Preston figured out how to jump on the trampoline. Like really jump. He was so proud of himself and we were all so excited. I even mentioned to my parents that Preston would like a trampoline for his birthday, you know just in case they'd forgotten it was coming up. Preston also did his fair share of mac'n'cheese eating this week. Not that I expect that to surprise anyone since it is one of the few foods he actually eats. Just that mentioning it gives me an excuse to share the following picture of him, which I find adorable cheese covered face and all. At least the warmer weather has. We are beyond excited in our household. We spent today racing around through the sprinklers. Only to end it with me finally building up the energy to pull out ALL of our summer toys. This is not a simple task people. I spent well over an hour blowing things up and we have an air pump. Somehow I'd forgotten how much we had and as I pulled out each new toy I would wonder how there could possibly be more. Here is our backyard in it's current state. I'm thinking Preston is going to have a blast tomorrow when we go out to play. Do you want to come over too? I think we might have enough room for friends. Also lessoned learned. Last year I decided not to worry about packing up the blow up pools and outside toys when Fall hit. I thought what could possibly go wrong they're pool toys. After I spent an hour scrubbing down all the dirt and other disgusting stuff tonight, I'm thinking that this year packing up the summer toys will go a lot differently. It was bad. Really bad. And I'm not even one of those parents that freaks out about Preston playing in the dirt and getting a little dirty, but I could not let him play in these until they were scrubbed and hosed down. Preston better not ever try to say I've never done anything for him! I love three day weekends! With Brad working so much lately it was nice to have him home for three days in a row and get to keep him all to oursleves. Just as exciting was that we were finally going to have the time to get some things done around the house. Saturday Brad and Preston hooked my sink back up. Hurray for running water in my kitchen again. It was also a day of yard work. And lots of yard work. Brad's Mom came over and mowed our yard while Brad hacked at all the weeds. I attempted some yard work only to be sent inside because guess what? I don't like to get dirty. I think I was more in the way than helping. Plus I was only supposed to be helping so that Brad would install the mowline I've been requesting but once that idea got put on the back burner I was sent into the kitchen. So instead I enjoyed the air condition and putting my kitchen back together. While Brad's Mom, Tammy, was here we took advantage of the help. She loaded up her truck with all of the garbage that was on the side of our house waiting to be taken to the dump and then her and Brad made not one but two dump runs. We have really been cleaning out the junk lately. Dump runs, trips to GoodWill, CraigsList, and giving things to my sisters. It's starting to feel pretty awesome not to be quite so cluttered. Not that we are completely clutter free around here. That's a dream that won't happen. At least not while I'm around holding onto silly things. Like I still have a water bottle that Brad gave me while we were dating that he wrote "I heart you" on. Awww, how cute. Sunday was spent doing more yardwork and things around the house. Brad fixed our fence. With more than a little help from Preston. Preston is such a Daddy's boy on the weekends. He wants to help Brad with everything. It's so adorable. It also means that Preston is a mess. He runs around playing and "working" outside with Brad. By the time he is ready forced to come in he has to take a bath just to play inside or take a nap. He's that dirty. We opted out of working on much of anything on Monday since it was a holiday and paid day off and all. Instead we looked at things that we'd like to do to our backyard and front yard. Just laid around enjoying the extra day of the weekend. I'm feeling incredibly thankful to all those who make Memorial Day possible. For many more reasons than just having the extra day of the weekend. Thank you for all that you do! Hope you all enjoyed your weekend. I hope it was spent doing much more interesting things than yard work and house cleaning. Are you just loving how my titles completely reflect how behind I am in blogging these days? I'm hoping that by doing it this way I will catch back up and stay caught up this time. One can dream right? But I'll try my hardest. We started the week off with Preston turning 22 months old. Can you believe it? Twenty-two months?! What a big boy! I have two months to throw a birthday party together. It will be fabulous, I promise you that. Whoa, now I really just added some pressure. I will add some pictures for you though, you know in two months when it happens. That's me, always thinking ahead. It was tough to top Preston turning 22 months old on Monday, but we attempted. We started taking a walk after dinner this week. It's fun and unwinding for both of us in preparation for bedtime. It's cute to watch Preston point everything out to me as we stroll around the neighborhood. He's learning so much these days. It astounds me. I ask him to point things out and he quickly does. Preston also gets so excited about going for a walk. I tell him we're going and he's all set. He sits down for his shoes, grabs the selected choo-choos that get to come with us, and then when I open the door he climbs into his stroller all set to go. The fresh air really seems to tucker him out making bedtime seem so much easier. In an effort still to top Preston turning 22 months old this week, we went to the Fish Hatchery with one of my Mommy groups. My word, Preston was loving that place. There were "Nemos" everywhere he looked. We even fed the fish some of their food. Looks like that Finding Nemo theme that I selected for his birthday party is going to be a hit. With the birthday boy at least. Preston also had a little bit of an incident with mud while we were there. We found a huge puddle and in the two seconds that it took him to run over there and walk through it I stood in shock, mouth open, staring. Good thing he was in sandals. He seemed unfazed so I played along too. 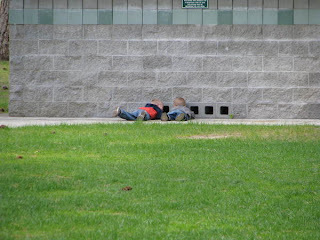 After the Fish Hatchery we headed over to a park by our house to play with some friends. Preston is becoming much more independent and interacting so much more everyday. He was off and playing with his little buddies the whole time we were there. 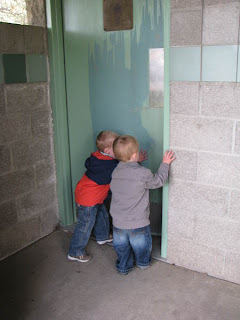 The boys even found their way over to the bathrooms where they yelled in the little holes at the bottom to hear the echo in the building. When they disappeared off to the side of the building we headed over to check on them. I assumed that because the bathroom doors had to be pushed open and were in fact heavy that guaranteed that the boys wouldn't gain entry. Wrong. They worked together to conquer their obstacle. Guess what, we also got to go see my friend Courtney's new house! That gets pretty close to topping Preston turning 22 months old. Courtney moved from being 45 minutes away to being 10 mintures away. Can I get a WOOHOO! I am beyond excited about this. Now I will be able to see her more spur of the moment and not a moment too soon with the weather getting nice out! I can't believe I almost forgot to mention this...they started work on our kitchen again! I got a call Friday morning that our countertops were in and they wanted to come out if I was available. Let me think about that, I have been living with half a kitchen and a laundry room sink for the last three months. No big deal or anything. The good news is that they got my cabinets and countertops installed and Brad finished the floors this weekend. Hello kitchen! The bad news is that they chipped my brand new, just came in, and been installed countertop. Can you believe it?! I'm royally pissed. I will be calling first thing tomorrow to see if they are able to fix it or if they will have to reorder it. I will most definitely keep you all informed on what's going on. I know that you all are just dying to know. Or not. You know, no big deal. I'll just be crying in the corner. By myself. Or something. With a little bit of sunshine poking through on Friday, we took advantage. Good thing since that little bit of sunshine turned into full blown sunshine. Preston and I rounded up my Mom and off we went to see some big kitties. I'm not sure if Preston enjoyed the cats more or if he was just thrilled to be outside. It was a toss up. Although he did seem pretty excited to get in and see where we were. As evidenced by the fact that he refused to wait for me and my Mom to finish paying before he took off. It was a good thing these cats were fenced in. Preston was so excited to see them that he got right up in their space and would have reached out to pet them if he could have. One cat in particular seemed very interested in Preston. And by interested I mean that he wanted to eat Preston. As we hung out by his home he jumped up several times on the fence and followed Preston with both his eyes and his body. Keeping an eye on his every movement. Preston found this hilarious. Once again, I was grateful for the fences. Preston was even willing to take some pictures. Although the only one that turned out good enough was this one of him and my Mom. Since I am unwilling to post a horrible picture of me and him on here for you to laugh at you will just have to settle for this one. Preston also found another thing that he would like for his birthday. I'm thinking that a tiger might be a little much though. But I'm not one to tell my son no. So if you would liket to make all of Preston's birthday wishes come true, he would like one tiger please. After seeing all of the lions and tigers and bears (oh my! 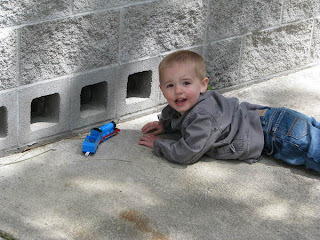 ), Preston was content to entertain himself walking around up on the landscaping retainer wall. Who knew he could be entertained so easily? We will be going back. After all I can think of nothing better to do than taunting that white tiger with the meal he'll never have.